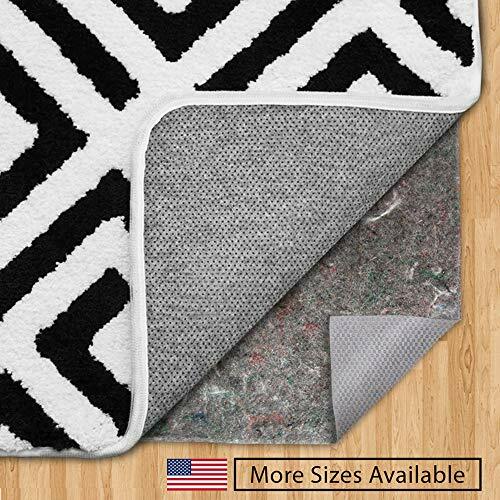 Better Homes & Gardens Premium Cushioned Non-Slip Rug PadCategory: Cushioned Rug PadThe Better Homes and Gardens Premium Cushioned Non-Slip Rug Pad is made from 100 percent PVC-coated Polyester. The cushioning adds comfort to your area rugs. Mainstays Non-Skid Rug PadCategory: Cushioned Rug PadThis rug pad provides extra comfort underfoot. Safavieh Premium Rug Pad for Hardwood floor and CarpetCategory: Cushioned Rug PadDura Pad features a needle-punching fabric with textured waffle-backing for improved gripping power on hard surface floors and carpets. It provides the ultimate in cushioning and insulation for fine rugs. Dura Pad is also designed for use under rugs of any kind and helps prevent premature wear. 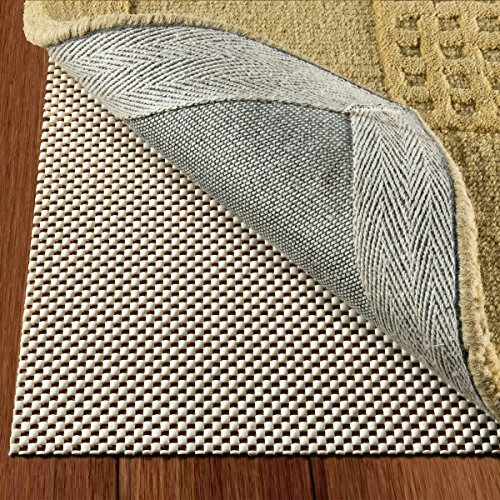 Safavieh Deluxe Ultra Rug Pad for Hardwood FloorCategory: Cushioned Rug PadThis deluxe Safavieh rug pad for wood floors can help keep a carpet in place on slick surfaces. It is made from a high-quality polyester fabric and coated with a high-grade vinyl compound. This item can prevent a carpet from sliding and slipping on hard surfaces. Use the area rug pad under many of your favorite carpets and enjoy a safer place to walk and play. It can be custom cut to fit under rugs of various sizes. The pad also works to help extend the life of a carpet. It does this by providing a smooth, supportive base. The millions of tiny openings allow air to flow freely in and out of the fabric. The rug pad for hard floors can be easy to care for and clean. It is constructed of anti-microbial material. It works to inhibit the growth of odor-causing bacteria, mold and mildew. In addition, it is fire resistant and moth-proofed, so you can use it and store it with minimal worry. The Safavieh rug pad ensures that nearly any carpet can stay in place and last longer, too. 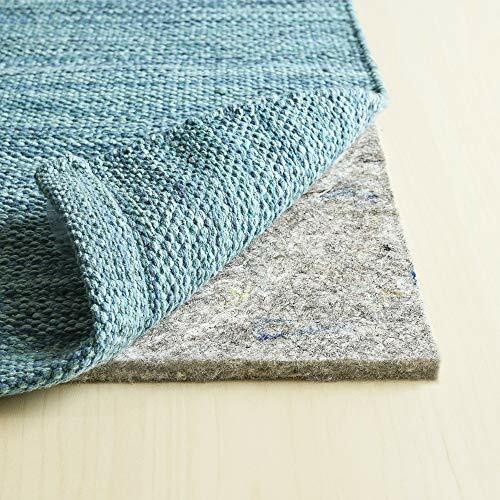 Rug Pad Central, (6' Square) 100% Felt Rug Pad, Extra Thick- Cushion, Comfort and ProtectionCategory: Cushioned Rug PadMade in USA by Rug Pad Central - 100% recycled felt in a full 3/8" thickness; Prolongs the life of your rug and floor - Extremely dense; Hypoallergenic; Mold/mildew resistant; LEED certified for air quality; Excellent noise reduction rug pads for use in apartments, co-ops, etc. 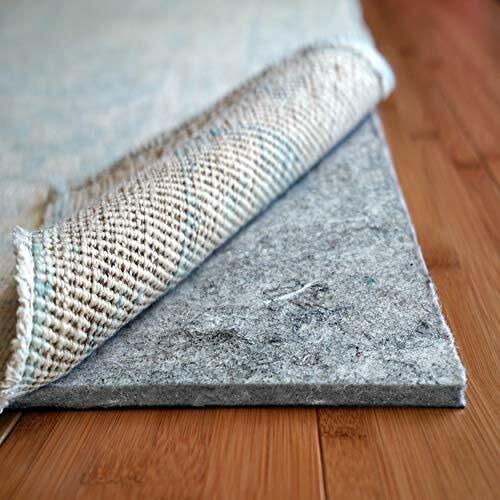 Dense supportive felt layer is non-abraisive and will not scratch your floor. Felt is safe for all flooring surfaces. (Hardwood, Concrete, Tile, Laminate and others) Needle punched felt is breatheable and also safe to use with radiant heated flooring. Does not have a rubber backing and will not prevent slipping, so not ideal for smaller rugs. 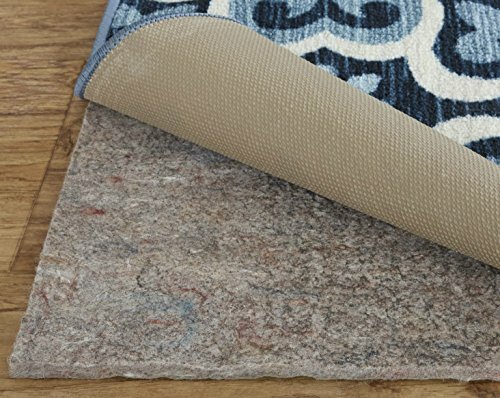 Safavieh Exceptional Ultra Rug Pad for Hard FloorCategory: Cushioned Rug PadUltra pad is made from a superior quality polyester fabric coated with a high-grade vinyl compound. It features superior grip strength which keeps rugs from sliding and slipping on hard surfaces. It also extends the life of rugs by providing a smooth, supportive base, while millions of tiny openings allow it to breathe. It can be easily cleaned with warm water and a mild detergent, rinsed and laid flat to dry. Ultra Pad is anti-microbial to inhibit the growth of odor-causing bacteria, mold and mildew and is fire-retardant and moth-proofed and can be custom cut to fit any rug size. Ultra Stop Rug PadCategory: Cushioned Rug PadProtect your floors with the Ultra Stop Non-Slip Rug Pad. Featuring an open weave construction with a non-slip polyester net, this piece is sure to stay in place. The cushion rug pad has extra-thick cushioning so that you and guests can walk more comfortably. The item has been treated with an antimicrobial solution to prevent mold and mildew. The pad can be trimmed with scissors, so you can custom fit it to your rug. It is designed to be used on hard floor surfaces, which can include hardwood floors, tile and cement. This rug pad will lengthen the life of your rug, so you can enjoy it for many years to come. 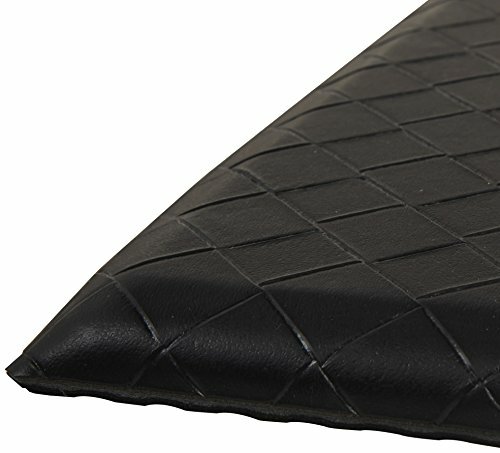 RugPadUSA Anchor Grip 30 Felt and Rubber Felt Rug Pad (0.37'')Category: Cushioned Rug PadFeatures: -Strong grip: Their signature natural rubber backing is made with an additional 5 oz rubber coating for enhanced non skid performance and durability while reducing premature degradation. -Eco-friendly: Made in the USA using recycled felt and natural rubber, No plastics or PVC. Low VOC's - Mold, mildew and moth resistant, hypoallergenic.. -Pad will anchor a rug on top of a carpet. Material: -Rubber/Felt. Color: -Black. Dimensions: Pad Thickness: -0.37". Rug Pad Size Rectangle 2' x 3' - Overall Product Weight: -1.9 lbs. Rug Pad Size Rectangle 2' x 4' - Overall Product Weight: -2.5 lbs. Rug Pad Size Runner 2' x 8' - Overall Product Weight: -5.1 lbs. Rug Pad Size Runner 2'6" x 9' - Overall Product Weight: -7.1 lbs. Safavieh Special Grid Rug Pad for Hard FloorCategory: Cushioned Rug PadGrid Pad is made from polyester fabric coated with a high grade vinyl compound allows maximum air circulation through an open weave construction making vacuuming easy. It helps keep tapestries and rugs safe from accidental slipping. It can be easily cleaned by hand-washing in a mild detergent, rinsed, and laid flat to dry. Grid pad is anti microbial to inhibit the growth of odor-causing bacteria, mold and mildew and is fire-retardant and moth-proofed and can be custom cut to fit any rug size. 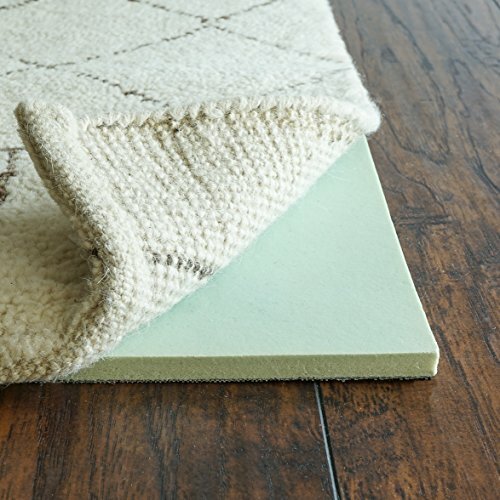 Rug Pad USA, 3/8" Thick, 12x17-Feet Rectangle, Felt & Reinforced Natural Rubber, Anchor Grip 30Category: Cushioned Rug PadAnchor Grip 30 is a premium non slip low VOC rug pad designed to be high performing as well as safe to use with your flooring surface. Anchor Grip 30 uses a natural rubber and heat pressed felt combined to create the effective solution for your rebelious rugs. About a 3/8" thick offering some nice cushion and providing protection from impact or abraision on your flooring surface. We make our pads in the USA to maintain the highest standards of quality and control in the manufacturing process ensuring a consistent and long lasting product. 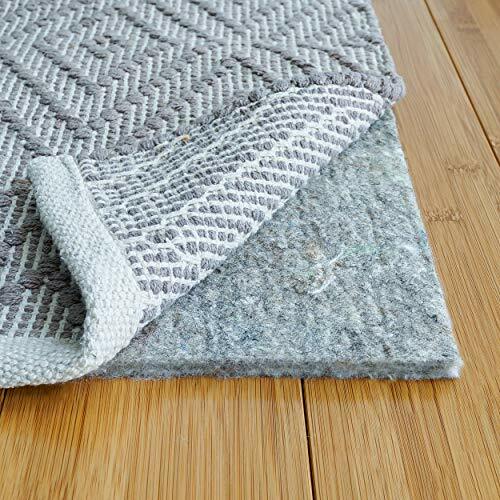 Unlike traditional open weave rug pads our Anchor Grip 30 is solid allowing the pad to catch dirt and debris falling through the rug instead of onto the floor. Safe to use with all flooring types but it is always recommended to check with flooring manufacturer. 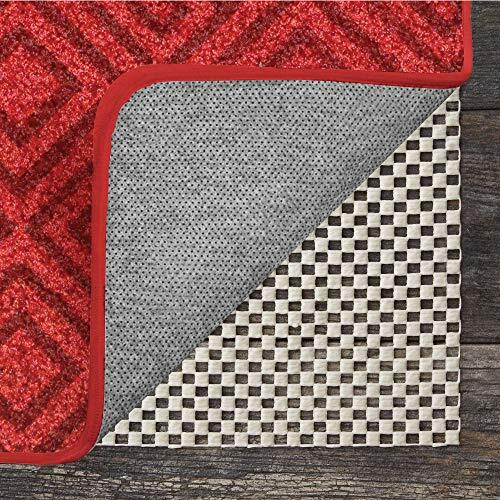 Safavieh Upgraded Grid Rug Pad for Hard FloorCategory: Cushioned Rug PadGrid Pad is made from polyester fabric coated with a high grade vinyl compound allows maximum air circulation through an open weave construction making vacuuming easy. It helps keep tapestries and rugs safe from accidental slipping. It can be easily cleaned by hand-washing in a mild detergent, rinsed and laid flat to dry. Grid pad is anti microbial to inhibit the growth of odor-causing bacteria, mold and mildew and is fire-retardant and moth-proofed and can be custom cut to fit any rug size.